Help Aelita destory the monsters with her Energy Fields! To take out as many Kalamars and Krabs as possible before they get you. You play as Aelita and you must perform the given button combo before time runs out. If the enemies manage to reach Aelita, they will attack her and you will lose a life. If you lose 3 lives, you get a game over. Directional keys: Allow you to perform the given button combo. 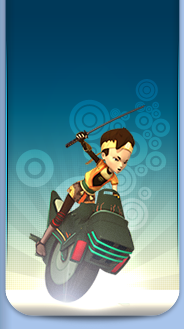 You play as Aelita, and you must take out the enemies that approach you. The number of Kalamars and Krabs that show up do not change how you should battle them. You have three lives and each time you destroy a monster, you gain one point. You win 100 points for each monster you battle and you grow a level every third attack, but you can no longer level up once you reach level 6.